While the semi-pro EasyShare Z980 hogs the limelight, Kodak is also sneaking out three new additions to its M-series range of digital cameras. 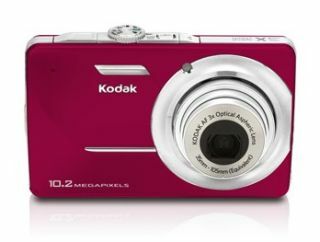 The best of the bunch is the Kodak EasyShare M380, featuring a 10 Megapixel sensor, 5x optical zoom and a 2.7-inch LCD. Available in black, red and teal (a greenish bluey colour), it'll cost $179 (£118) in March. A step down is the Kodak EasyShare M340. This compact camera includes a 10 Megapixel sensor, a 3x optical zoom and the same 2.7-inch LCD. Also available in March, in blue, teal, silver or red, the M340 will be priced at $149 (£98). Both the M380 and M340 rely on Kodak's Smart Capture technology to add behind-the-scenes polish to your photos. While the M320 lacks Kodak's Smart Capture package, it does feature the Perfect Touch technology, which provides automatic red-eye reduction, shadow lightening and other photo-buffing effects.